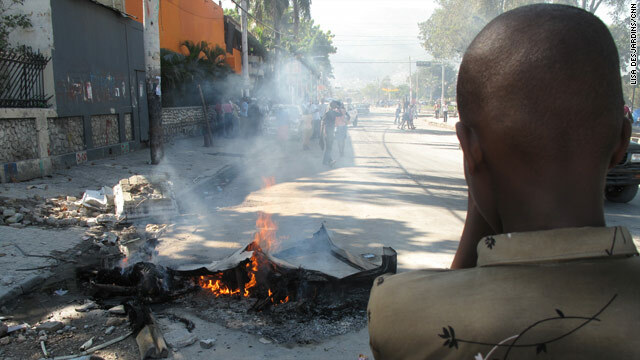 Three bodies burn Monday in a quake-crushed taxi in Port-au-Prince's Champs de Mars plaza. Port-au-Prince, Haiti (CNN) -- The scene was horrific, the stench unmistakable. Sadly, it was nothing new here. But because it unfolded so many days after the earthquake that took at least 112,000 lives, it was shocking. Three bodies trapped in a crushed taxi. A man, two women. Set ablaze. Even for those who have witnessed so much these past 13 days, the torching of the Toyota in the capital's central plaza Monday was difficult to take in. It highlighted one of Haiti's many quandaries: how to dispose of bodies. The taxi had been smashed by collapsing concrete during the devastating earthquake, and the bodies were decomposing in tropical temperatures, the smell unbearable to the thousands who have temporarily sought shelter under tarpaulins and tents across the street at the Champs de Mars plaza. The foul smell prompted people to dig the car out of the rubble, but those living on the street in the area said disposal trucks never arrived to take the bodies away. "They couldn't find anyone to dispose of the bodies so they had to burn them," said Gidel Fellmon. In the days after the January 12 quake, Haitians and rescue and relief crews have struggled to find proper disposal methods for bodies. Thousands of corpses have been pulled from the rubble and burned. Bodies have been bulldozed and dumped into open pits. At one of the capital city's cemeteries, people opened up old crypts and shoved corpses into them before resealing them. Workers loaded bodies -- piled on the sides of roads -- into the basket of a front-loader tractor, which then deposited them into blood-stained dump trucks, according to CNN correspondents. On Monday, as the taxi burned, people stood stoically around the charred flesh and exposed bones. Two pairs of shoes lay in the car's twisted metal.